The American Female Guardian Society was formed in New York in the spring of 1834. One of its members, Mrs. M. A. Hawkins, soon turned her attention to the plight of single mothers and prostitutes. Women who became pregnant while not married suffered serious censure, branded as "fallen women." Hawkins's deep concerns led to the formation of the New York Moral Reform Society that same year. 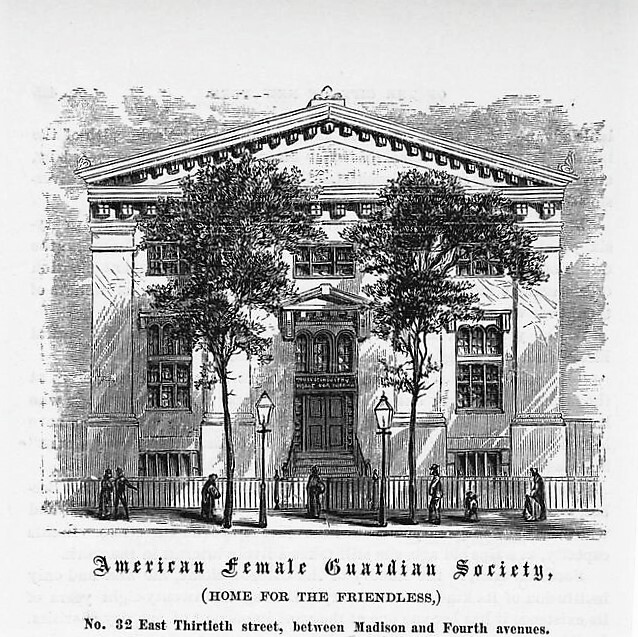 As the American Female Guardian Society's Our Golden Jubilee explained in 1884, "The care of homeless, friendless women involved the care of children. If we can save the children, we shall not have so many suffering and sinning adults to provide for, was the thought that grew and strengthened." Mrs. Hawkins lobbied for a "Home for both these destitute classes." After a long, tireless struggle, Mrs. Hawkins got her way. In July 1847 a house was rented to be used as The Home of the Friendless. For two years unwed mothers and their children were taken care of there. 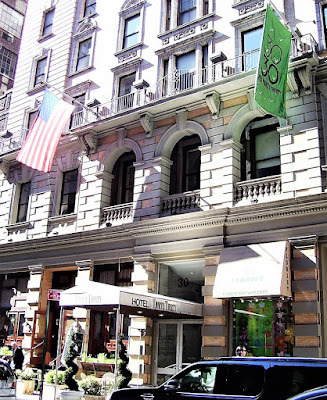 In the meantime, land was purchased on East 30th Street, between Fourth (now Park) and Madison Avenues, and on May 5, 1849 the cornerstone was laid. Our Golden Jubilee remarked "The site selected was then quite up-town, in the centre of an almost vacant block, well shaded with trees and green with shrubbery. The neighboring streets were laid out, but unpaved, and there were few buildings in the immediate vicinity." The building was dedicated on December 13, 1849. The architect, whose name has been lost, created a stately three story Greek Revival edifice. Full-height pilasters divided the three bays of the front facade and visually supported the classic triangular pediment. The New York Herald reported the construction cost at $18,577.57--in the neighborhood of $615,000 today. Of that amount only $2,800 was still unpaid. A religious tract published in 1879 described the original residents as being mostly "widows, mothers with dependent children, and adolescent girls seeking employment." The Home was operated solely on donations and pleas for contributions routinely appeared in newspapers. Following Thanksgiving in 1850 a notice in the New-York Daily Tribune said in part "It must take considerable, in the provision line, to feed an average family of one hundred adults and children, and we were glad to learn that our citizens remembered them so liberally the last season." We are instructed by Miss Lind to request your acceptance of the enclosed donation of five hundred dollars to the funds of your Association as a mark of the warm interest which she feels in so excellent a Charity belonging to a City where she has been received so kindly. We beg leave to add our own best wishes, to those of Miss Lind, for the continued prosperity and usefulness of your Institution. The Home for the Friendless (or the Home of the Friendless as it was also called) was never intended to be a permanent home. Women and their children were welcome only until they could procure employment and a respectable place to stay. The New York Times explained "Those friendless females...are surrounded by strong temptations, and such as are the mark for the designing, are afforded a home till employment can be found in the country, where they may be safe." A journalist from that newspaper visited on Thanksgiving Day, 1853. The description he painted may have been a bit rosy. "Entering from the front it does not seem so much like a public as a private house," said the article. "Wonderfully pretty ladies, with petted children accompanying them, are moving through the halls, into and out of the various parlors." The writer was shown "the pleasant places, the snug store-room, the clean and tidy kitchen, and school-room hung round with slates and maps, where the urchins under the charge of another lass scarcely older than themselves, are singing some pleasant childish thing to the tune of 'Lilly Dale'; the well-ventilated dormitories all fitted with iron bedsteads; the nursery where the several little ones are frolicking on the floor; the sick-room which seldom--it is a matter of heartfelt thanksgiving with them to-day--has an occupant, and the dining-room." 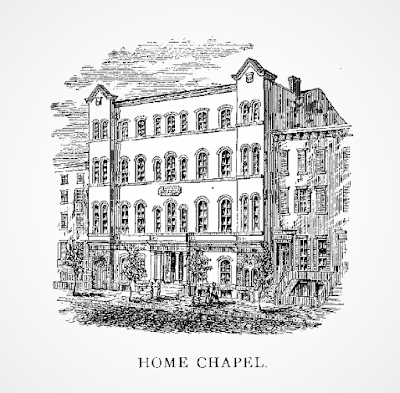 In 1856 the property directly behind the Home, on 29th Street, was secured and another building erected for school rooms, a chapel, and a publishing office. The following year the Home's charter was amended to accept orphans. The children were trained in the facility's Industrial School where boys learned a trade and girls were taught domestic skills. In what today is often seen as cruel, the Home For the Friendless partnered with the Children's Aid Society to send young boys to "the country" to live and work. Farmers and small businessmen, like hardware store owners, petitioned for a boy who would be sent on what became known as an "Orphan Train." The plan was to get the boys out of the corrupt city and give them a new life. In fact, the orphans were indentured servants--in other words, slaves. While some were treated well, others suffered. In 1861 there were 208 women and 372 children in the Home. The Home School gave instruction to 610 pupils. But the bloody Civil War was about to swell those numbers. 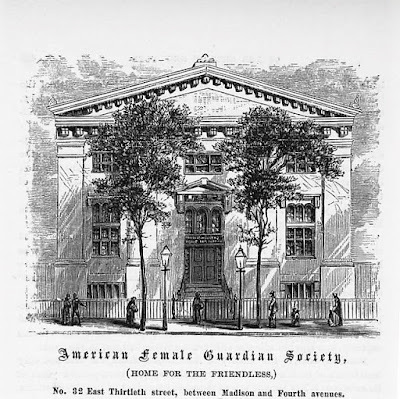 In May 1865 the Female Guardian Society reported "A large number of the friendless ones received into the home were the children of soldiers." The report was pleased with the well-behaved orphans, noting "Accounts of a specially favorable nature had been received of five hundred of the Home boys, and only thirty-nine the reverse." Another institution which sheltered war orphans was the Union Home School. The two groups faced off in court on February 8, 1865. The Union Home School demanded that the Home for the Friendless return "certain children alleged to have been spirited away from the Union establishment," according to The New York Herald. The newspaper said "the court room was crowded by a large number of ladies and gentlemen, who were eager to learn the result, and came in their carriages for miles around to be present at the tilt between the opposing counsel." The Union Home School asserted that the Home for the Friendless had, essentially, kidnapped orphans "simply to defeat the appropriation donated by the Legislature and turn if over to the Home of the Friendless." The Home of the Friendless countered, saying the Union Home School had no right to act as guardians and attempted to produce affidavits "to show how badly things were conducted in that establishment." The judge was not interested, saying he "desired to hear the legal argument of the case." Institutions like the Home for the Friendless were pet projects of wealthy socialites. 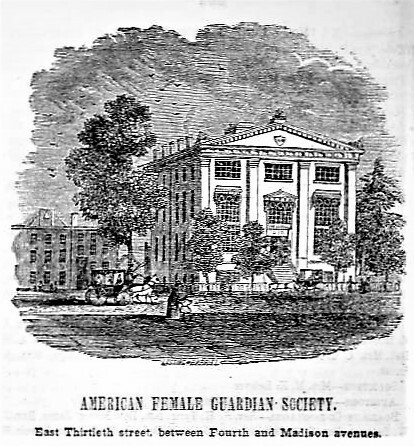 On August 28, 1867 the New-York Tribune reported "The children of the Home of the Friendless spent yesterday quite pleasantly at the mansion of Mrs. D. C. Hays, at Inwood." 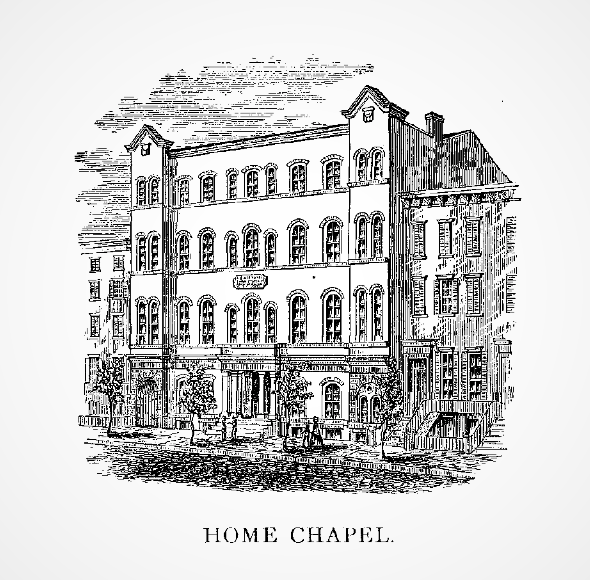 From its inception the Home for the Friendless was a Christian organization. And the charity of the women who ran it did not extend to Jews. The religious bigotry was exemplified in 1880 when a young boy, James Smith, was taken in by an actress, Mrs. David Fuller. The Home apparently did not mind that she "used him in child's parts on the stage," as reported by the New-York Tribune on October 31 that year. But when she found herself unable to support him and asked pawnbroker Robert J. Rosenthal to take him. Rosenthal and the boy grew close. The Tribune reported "He conceived a fancy for the child, although he was a Hebrew and the child was born of Christian parents." When the actress changed her mind and demanded the boy back, Rosenthal refused. So she went back to the Home for the Friendless for help. On October 30 the boy was turned over to the Home. "This was done on representations that Mr. Rosenthal was not a proper person to bring up the child, and that in his home the child would not be surrounded by proper influences," said the Tribune. "The Surrogate yesterday decided that the society had the right to the custody of the child, and he sharply criticised the method by which Mr. Rosenthal obtained the letters of guardianship." On May 8, 1889 the Home celebrated its 55th anniversary. Visitors were invited to stroll through the buildings and witness evidence of the organization's good work. They "came by the score and found awaiting them companies of little girls with white aprons and spick and span from crown to toe, and boys done up in neat clothing, with faces scrubbed, hair brushed, and boots blacked," reported The New York Times. The visitors saw an exhibition of the children's work, including sewing, knitting, writing, drawing and cookery by the girls, and carpentry and printing by the boys. The previous year the Home had sheltered 118 women and 361 children. Of those 59 children had been adopted. As the turn of the century neared, the Murray Hill neighborhood was fully developed. On February 23, 1901 The Real Estate Record & Builders' Guide reported that the Home had purchased land in The Bronx and had "recently sold the 29th street property to the Women's Hotel Company. 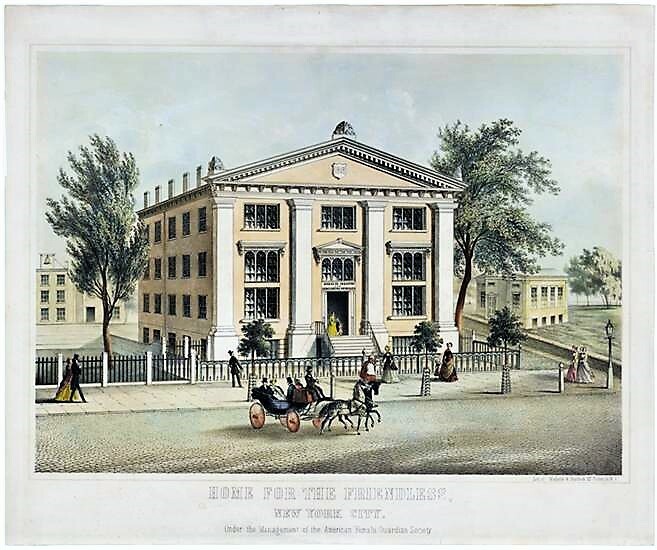 Months later the Home for the Friendless and the Home Chapel building were demolished, to be replaced by the Martha Washington Hotel, designed by Robert W. Gibson. It survives.